November 1, 2018 (Last Updated: April 7, 2019) - As an Amazon Associate I earn from qualifying purchases. Homemade Chicken Stock should be a part of every home cooks repertoire. 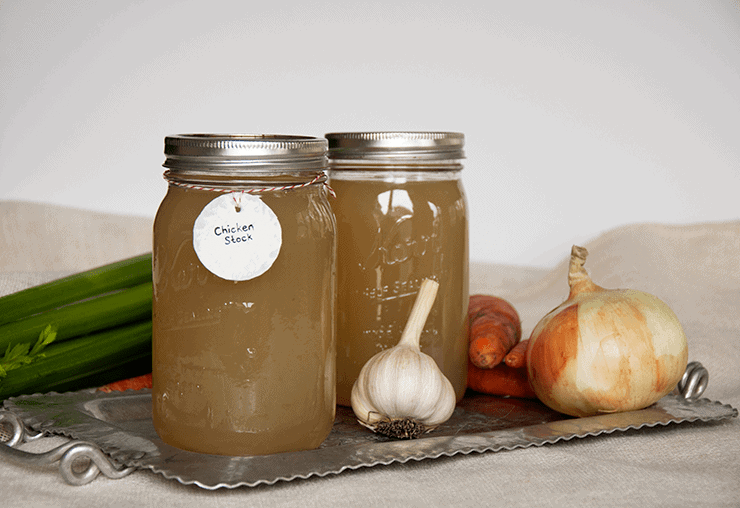 A good chicken stock can turn a simple, plain recipe into something that is truly magnificent. Don’t believe me? Make some of this delicious chicken stock for yourself. 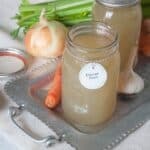 This Homemade Chicken Stock recipe is not quick, but it is absolutely delicious. In fact, it will make your house smell wonderful all day long. 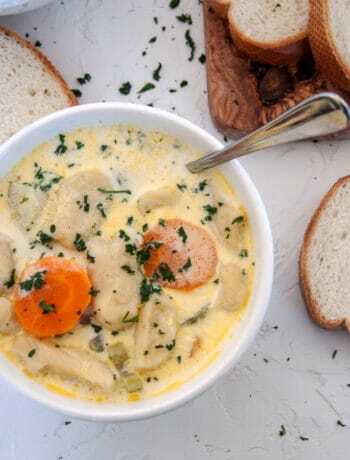 It is the kind of recipe that grandma used to make and the kind of chicken stock recipe that connects us with the world and our history. 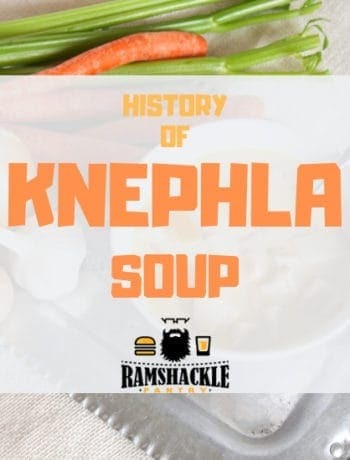 Today we are going to be working on a fundamental chicken stock recipe as part of our Knoephla Soup series that can be eaten by itself or as a base for any number of other recipes, like Knoephla Soup or Chicken Noodle Soup. Learn how to make your house smell this good too, with this Homemade Chicken Stock recipe. 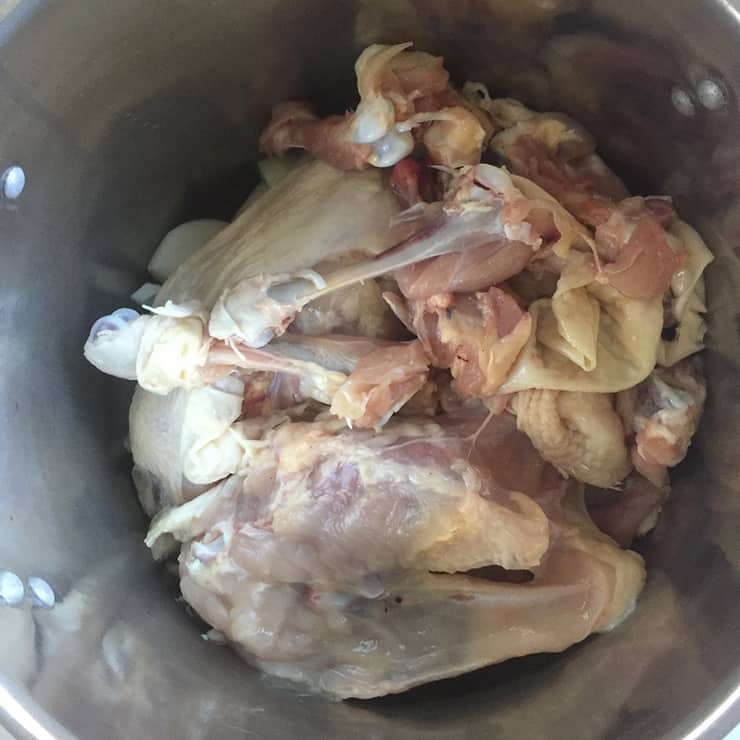 The basics are that we are going to take chicken bones and slowly simmer it in water to release as much of the collagen, fat, and flavor from them as possible. We are going to add other ingredients with the intention of transferring the flavors of those ingredients to our stock. So, we will be adding onions, celery, and carrots to the pot. We will also be adding the likes of peppercorns and thyme. Chicken stock is a slow-cooked dish that tends to use the fattier, raw parts of a chicken. It is mostly bones, but some small meaty parts could cook with the stock. The end result, when cooled, should be almost a gelatinous product due to the amount of fat in it. Chicken Broth is often bones and meat that are boiled quickly to empart the flavors into the water. You are going to get a richer, fuller flavor with chicken stock, but broth is faster. They can most often substitute for one another. Today, we are working on Homemade Chicken Stock. How Much Chicken to Use? I use about 5 lbs of chicken bones. Specifically, I like to buy 2 nice whole chickens (with neck if you can get them) and then debreast them. I put the breasts in a freezer and save them for a different meal. I then remove the meat from the thighs and legs and bag them up separately, as well, for use in whatever meal I see fit. That leaves the main carcass and the wings in the stock. I am not afraid to leave meat on the bones and it will help add flavor, but I do take the more valuable pieces of meat off and reserve them for better use. I think the opportunities are endless, but I like to keep it minimal. An onion, some carrots, celery, peppercorn, a few sprigs of thyme, and bay leaves are all that is needed. You can certainly add more, but these are what I would consider the bare essentials. Additionally, I choose to leave salt out of the equation, as I expect it to be used in individual dishes and added at that time. Once we have all the ingredients cut, rinsed and added to the pot, we add enough cold water to barely cover all of the ingredients. While it will not make much of a difference in flavor, starting with cold water can help produce a clearer broth. Then we put the heat on medium and bring to a bare simmer, that is “small bubbles breaking through the surface every 2 to 3 seconds in different spots”. Turn down or up the heat to make sure your stock stays at a bare simmer. We want the stock so that it is barely bubbling and cooking our cauldron of awesome slowly. To keep everything submerged, I use a heavy ceramic bowl and just place it in the middle of my pot to weight everything down. Then, we just let it do it’s magic for 6-8 hours! Once the stock is at the point of a bare simmer, you will start to notice scum accumulating at the top. Using a metal slotted spoon, remove it about once every half hour. When Is The Chicken Stock Done? You will find opinions galore on how long to cook your chicken stock. Anywhere from a few hours to all day. 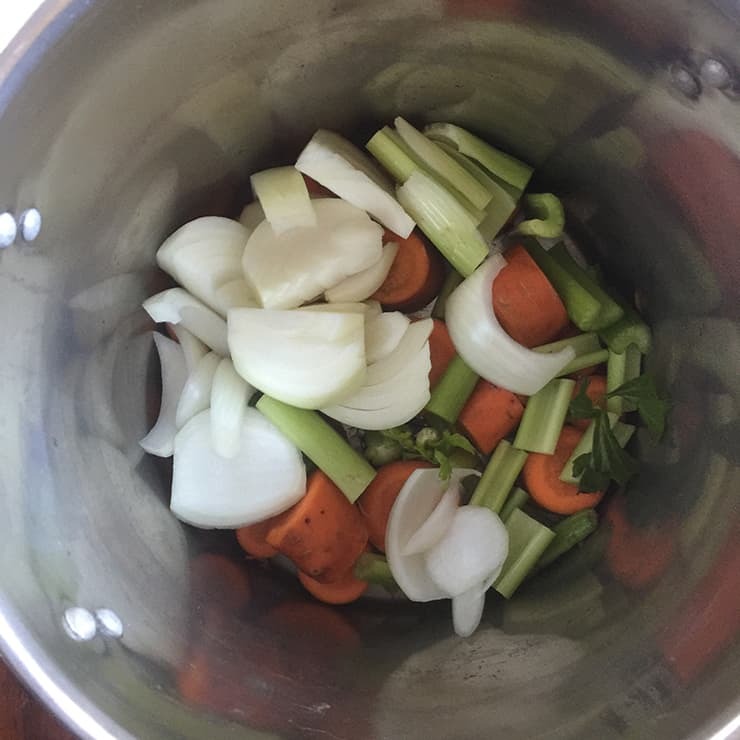 When I first learned to make a proper stock, I used a trick that if the large bones easily break, all of the tasty goodness is probably expelled from them and in the broth. This can take a very long time. In fact, I even experimented with separating them into two sessions where I cooked my stock the second day. That was a bit much. I have since come to a compromise with myself. After 3 hours, I taste the stock every hour. It should taste better than the last time. When it stops doing that OR it is 10 hours into cooking, the homemade chicken stock is done. Perhaps even step outside to remove yourself from the wonderful smell of your house for a few minutes so you can get a better full taste when you walk back in and go to your stovetop. I remove the chicken stock from heat and allow to cool for a little bit and then strain the stock. The finer your colander is, the better it is for the finished product. We want to get as many of the little tidbits of random stuff out of there. Put the stock in your refrigerator and allow to cool overnight. In the morning you should have a somewhat gelatinous liquid with a layer of fat on top. 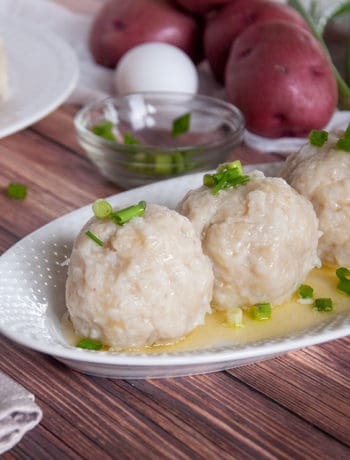 Using a spoon, remove that and if you are adventurous, that is Schmaltz and you can use it in other recipes. Once removed, there you have your beautiful, tasty homemade chicken stock. Use your stock up in noodle soup, casseroles, gravies, or any other chicken stock based goodness within a few days. I have added water to it before to get more volume from my stock, but it is the absolute best as-is. You can also freeze it and use it within a few months. Make sure to boil for a few minutes prior to use to ensure it has hit safe temperatures. 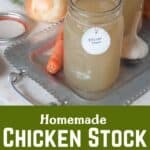 Making your own homemade chicken stock really is a fun thing and I love the way it makes my house smell. 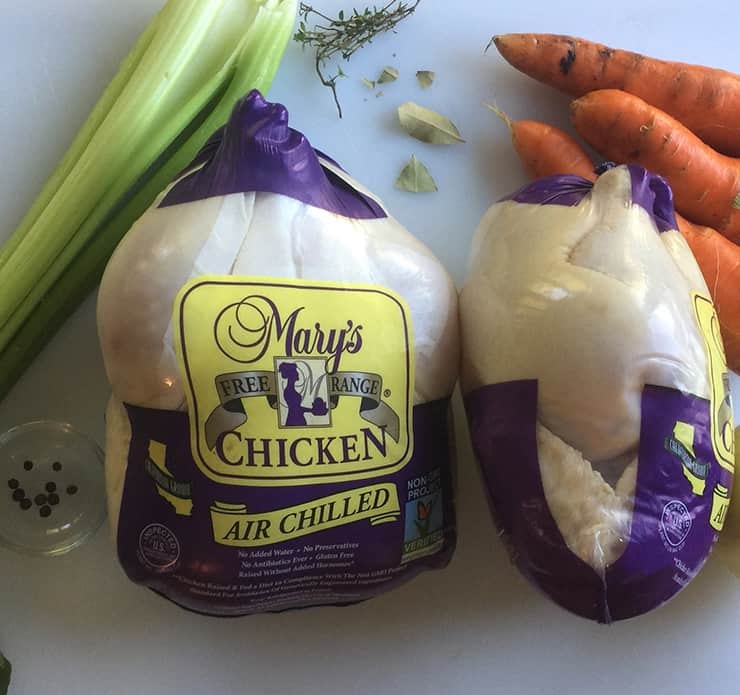 You, too, can enjoy a great chicken stock by making this at home! 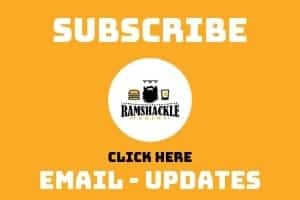 I hope you enjoyed our recipe and if you like what we are doing here, please sign up to get emails sent to you, follow me on Instagram, and follow me on Pinterest! A homemade chicken stock that will leave your bellies filled and your house smelling like an old-fashioned hearth of joy and happiness. This chicken stock takes a little time, but it is totally worth it. Use within 3 days or freeze and use within 3 months. Make sure to boil for 2 minutes before use. This post is priceless! Everyone should know how to make homemade chicken stock. It’s so much better than store bought. Well I learnt something today! I always thought that chicken broth was just the american name for chicken stock! This looks like it would be so packed with flavour! One thing I learned in this post is that I always thought that BROTH was just chicken, while stock was with all the veggies. I learned something in writing this.